The first rule of Skate Club is...you do not mess with the Mistress of Mayhem! Harley stumbles across an underground fight club where big money equals big body counts! She's in...and she's making Sy Borgman her agent. Plus, what would happen if the demented Clown Princess of Crime visited the most popular comic-con out there? 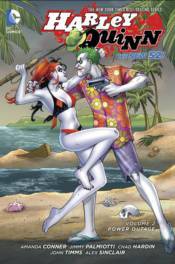 Collects HARLEY QUINN #9-13, HARLEY QUINN: FUTURES END #1, a story from SECRET ORIGINS #4 and the star-studded HARLEY QUINN INVADES COMIC-CON INTERNATIONAL: SAN DIEGO #1!